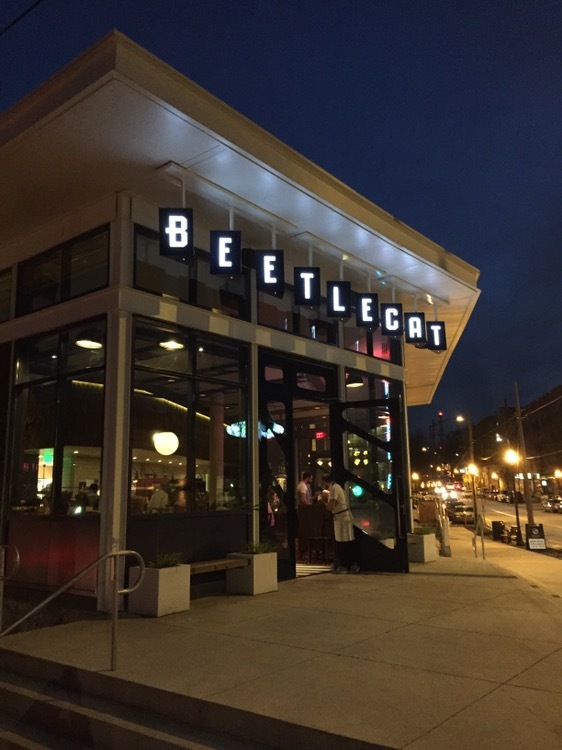 A couple of Fridays back, I saw a tweet from Belle Vivere of the lobster roll from Beetlecat and determined that we needed to get there soon. Seeing that they opened at 3:00 on Saturday, I figured we could wrap up an afternoon of in-town errands with a kind-of-early dinner, and we arrived around 5:30. This was good timing, as the upstairs, where we ate, was fairly empty when we arrived. Dining is first come – first served, and we took the end two seats at one of the communal tables in the center. Upstairs, the theme is New England sea shore, replete with a nautical theme throughout, up to the sails that make up the ceiling cover. 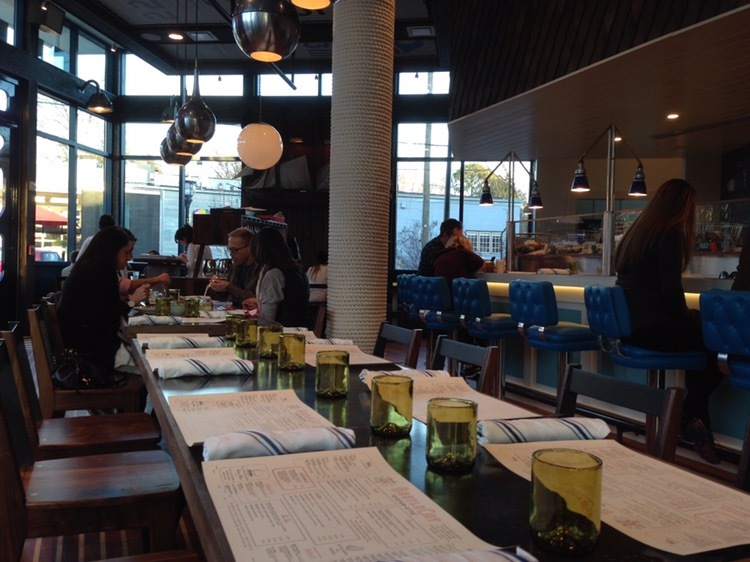 There’s bar seating, fronting the oyster bar and kitchen, on fabulous turquoise and chrome stools. 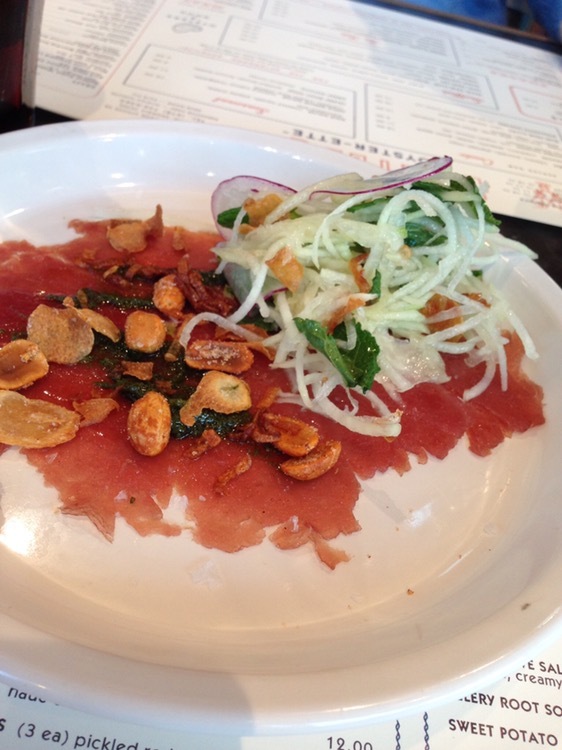 which was thin (like a carpaccio), with a Thai herb salsa verde, jalapeños, green papaya, peanuts and crispy shallots. The tuna was pounded paper thin and the mix on top really added to the flavor. One thing to pay attention to – food comes out as it is ready (not necessarily in the sequence you ordered it) and the plates are designed to be share-able. Note: share-able doesn’t mean that they are massive servings, but rather small plates that you can share amongst several folks. 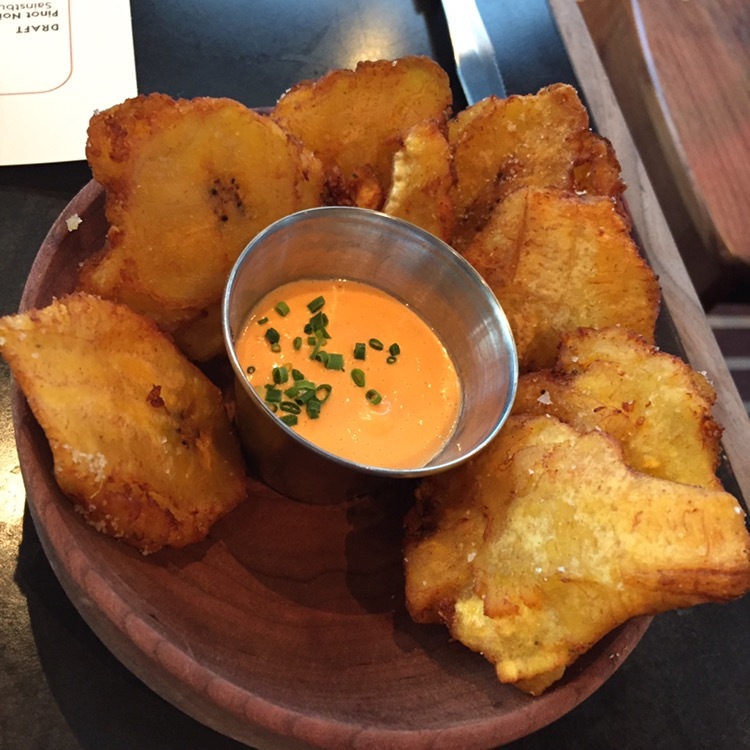 We ordered some tostones (fried plantains), which where served with an “oooeee” sauce. The sauce was like a spicy remoulade and these came to the table straight from the fryer, as they were Hot (that’s “hot” with a capital “H”). 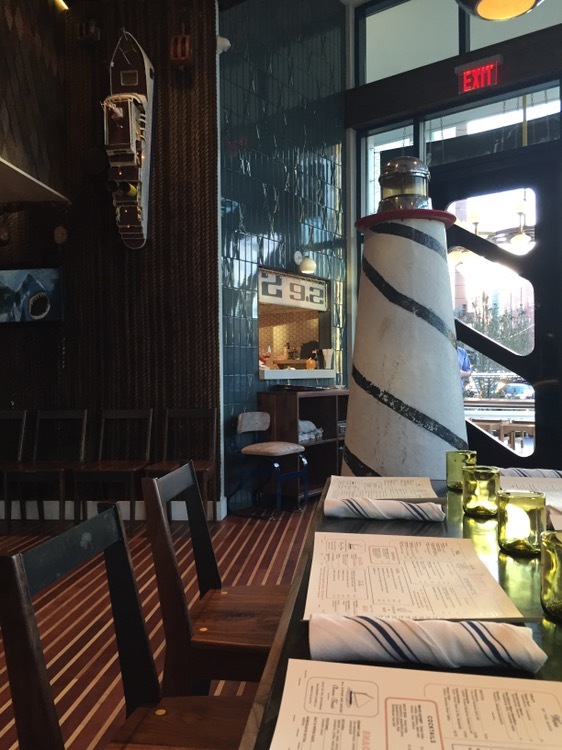 The menu is definitely seafood-centric, but there are a couple of land-based options. Next to arrive was my “entree”, a NY strip, served with buerre monte, escargots and crunchy toast. The escargots were served atop the strip, which was sitting on the toast and all appeared to have been topped with the buerre monte * and cheese and finished in the salamander. They had two temperature choices for the steak when I ordered (pink or not pink) and I saw why when it arrived – it was based on the preparation. 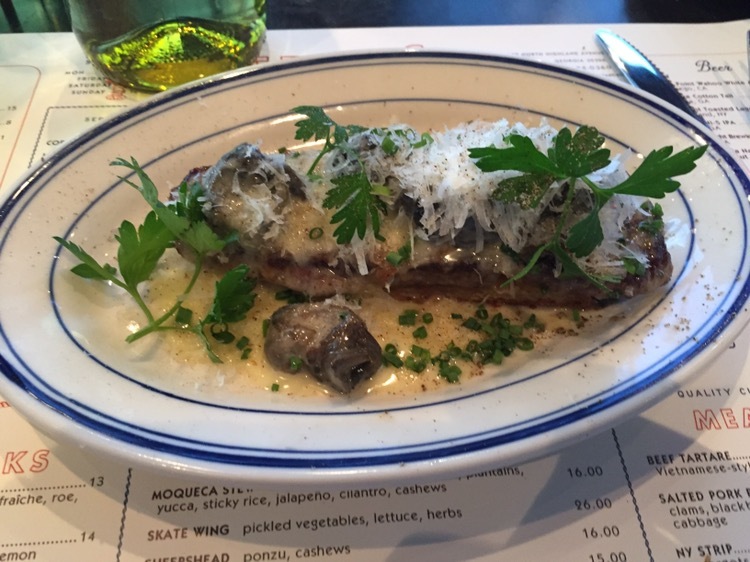 I’ve never enjoyed escargots before (I’ve tried them as an appetizer on a couple of occasions), but I took a vertical bite and the combination of the snail, beef, bread and dairy was fantastic. Texture-wise, everything but the beef melted in your mouth. The star of the show arrived next – my loved one’s lobster roll. 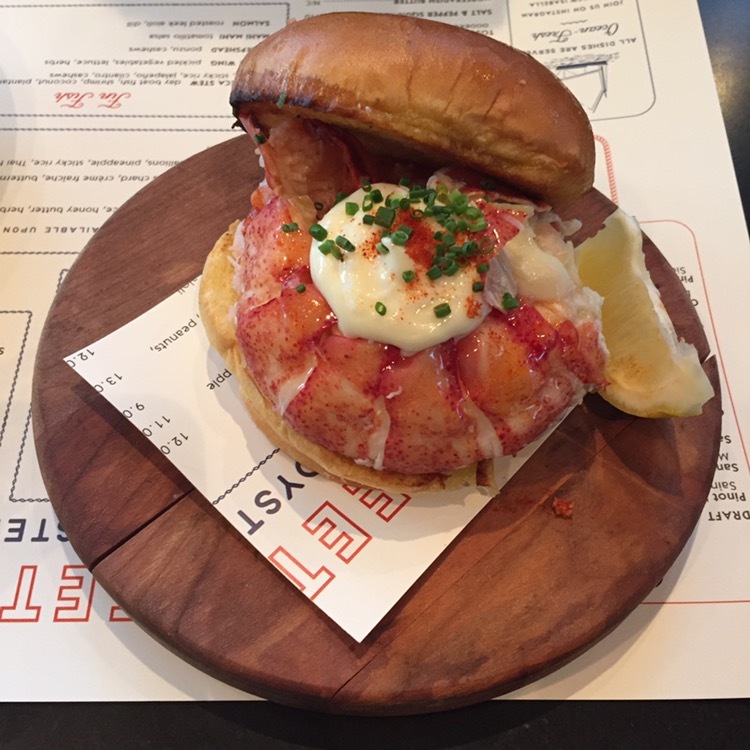 This was a thing of beauty – a pound plus of perfectly cooked lobster, on a hamburger bun topped with aioli. I had said when we were trying our first spot for lunch , as it was failing, there was no need to worry, “you’ll be having a lobster roll for dinner.” She thought me presumptuous at the time, but I think she was glad I was right, after dinner. I am not a lobster fan, but this sandwich was out of this world. I’d go back tomorrow and order another. 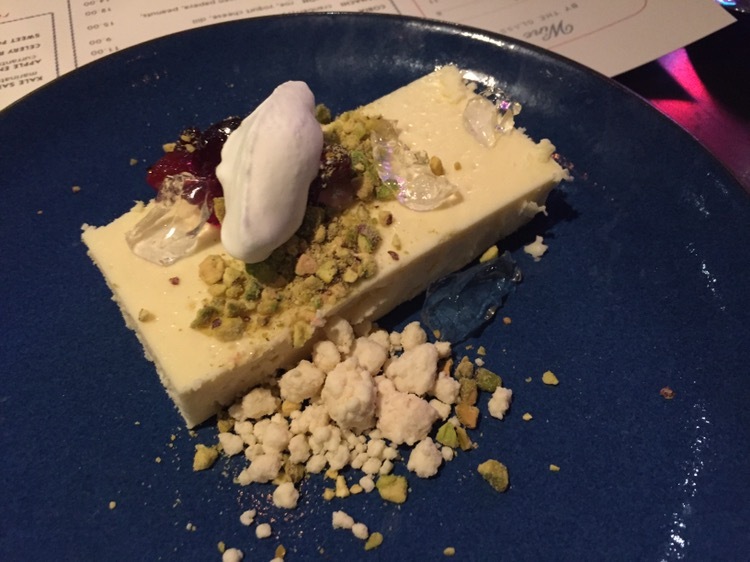 We decided to order a dessert – a lemongrass cheesecake, with cranberry jam, aloe gel, pistachio crunch and white chocolate struedel. The cheesecake tasted like lemongrass smells, with a melt in your mouth texture that was perfectly complemented by the cranberry jam. The aloe gel had very little taste, but this was a tasty way to end the night. Service was slow, at times, but the meal was very good. I’d like to go back with a couple of other folks and sample some more of the menu.